Hate is a poison as much for ourselves as it is for those we would use it against like a weapon of words or actions. It is a poisonous and treacherous waste of our own effort. It lacks the capacity for positive change that a nonviolent approach has. Minds are not usually changed for the better when hate is directed toward them. People throw up walls to defend themselves. They line their mental ramparts with reinforcements and toss flaming arrows of their own poisonous hate over the side, directed at their attackers, and no one wins. There’s another reason why you should love your enemies, and that is because hate distorts the personality of the hater. We usually think of what hate does for the individual hated or the individuals hated or the groups hated. But it is even more tragic, it is even more ruinous and injurious to the individual who hates. You just begin hating somebody, and you will begin to do irrational things. You can’t see straight when you hate. You can’t walk straight when you hate. You can’t stand upright. Your vision is distorted. There is nothing more tragic than to see an individual whose heart is filled with hate. But there is another way. And that is to organize mass non-violent resistance based on the principle of love. It seems to me that this is the only way as our eyes look to the future. As we look out across the years and across the generations, let us develop and move right here. We must discover the power of love, the power, the redemptive power of love. And when we discover that we will be able to make of this old world a new world. Do you see it? How powerful love can be? Change may not always come as swiftly as we would like. Indeed, it can take generations for positive change to be fully implemented to its final outcome, but if we look closely we can see the wheels of progress moving. We must stand firm on our goals for equality for all, for equal access, for fairness, for compassion, and be fueled by a love for our community rather than a hatred of those who would oppress our community. If you’re connected to the Deaf Community in some way, you likely realize by now that I’m sharing these thoughts largely because what has been happening with Alexander Graham Bell Association for the Deaf and Hard of Hearing (AG Bell). I’ve already written my own thoughts about how AG Bell’s post angered me and how I think we can win the hearts and minds of the undecided. Anger served a purpose in lighting a spark of passion, which is why we see so many beautifully written posts and letters as well as exquisitely signed videos charged with emotion. Many of us are indeed touched to see how we rise up against oppressive words. This is an incredible time for our community. I don’t want to see it derailed by words and actions of hate. When we write, sign, or act with hatred in our hearts, we risk giving fuel to the oppressors. We risk giving them words and phrases that they can then use with their own supporters to say “See! See how vicious their words have become against us.” They become more entrenched in their own views. They resist any willingness to consider our viewpoint, if they ever would consider them in the first place. When we direct hate at them, we risk making them stronger. Hate is a wasted act. Anger can have a purpose in getting us started, but love is what we need to fuel this movement that is surging once again. Love for our community, love for our language, love for humanity. If we act with compassion, more hearts and minds will be receptive to what we have to say. We won’t be the ones to change minds. If minds can be changed, it is people who change their own minds. If you want to try and win someone over to our perspective, which is that Deaf children have a right to full access to language at an early age through sign language and is then supported further by a bilingual education, then you have to do it with love. We have to demonstrate how and why we care for these children. We were once these children, and we need them to understand that. We need every ally we can get. We need hearing people to understand us better and see why our cause is a worthwhile one that is embodied by love and compassion, if we choose to make it so. We also need non-signing deaf individuals to see us in a respectful way, and how we do that is by respecting their own choices. This doesn’t mean we accept it when an organization like AG Bell spreads lies, whether intentional or not, but that we show respect for all. If a deaf or hard of hearing adult prefers the oral approach, Cued Speech, SEE, or some other method, we will not convince them of ASL’s value by criticizing them. We will not win over hearts and minds that way. Instead, we can respect all of them, embrace them as our brothers and sisters, and demonstrate our love of ASL by using it ourselves. If we treat them with love, respect, and compassion, they are far more likely to have the willingness to see us without judgement and fear. We must do the same. We can set this example. 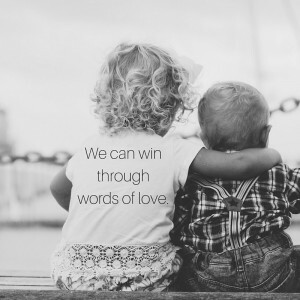 We must do the same for parents of deaf children who are motivated by love and often fear. Harshly criticizing their choices will cause them to put a wall between us that, once built, may never be torn down. This is why, when I meet parents of a deaf child, I show how much value ASL brings to my own life and encourage them to consider working toward their child being fluent in ASL no matter what other communication options the parents may desire. I don’t ask the parents to stop the other methods of communication. When we do this, a willingness to consider our advice is possible. I believe all the current efforts that are underway are worth doing. All the letters, the petitions, the online conversations, the quest to convince AG Bell funders to no longer fund them. AG Bell as an organization cannot continue to be what it is, an organization that is actively oppressing our community. All of these efforts are worthwhile and so important, but hate doesn’t deserve a place in any of this. It is counterproductive. It will never get us what we want. We can be strong, united, firm in our resolve for positive change for us and the children, without resorting to words of hate. Demonizing organizations by calling them or their leaders evil is not going to win over the minds of the undecided. Those who already support them will feel more protective. Those who are opposed to them don’t need these words to work like poison in our hearts. We can win with facts, with research, with our stories, and all of this with a positive nonviolent movement. Words can be violent. Name-calling is a verbal act of violence which gets us nowhere, and only poisons us. We do not need to feel sick with hate, but instead we should feel charged with love for our community. Keep up the fight, keep it positive and fueled by love. We are all together. While I wasn’t deaf as a child, I was hard of hearing. As I enter middle age, I am losing my hearing. I wonder how I will cope with it. See, Medicare, which is my insurance, doesn’t cover hearing aids. Faith, and hope, will find the way. Else, I will learn to talk in other ways. it has been a gradual loss, so it isn’t like it is something new. just an adaptation. something I have learned how to do while living the last 17 years with chronic illness. What is taken from us in one way, is returned to us in another. Peace. Do individuals have an equal right NOT to sign and acquire oralistic means to follow ? In attacking AG Bell and Co, few seem to appreciate parents and individuals have CHOSEN those means to acquire communication, and, the deaf culture and community needs to isolate their hatred for oralism when opposing, to NOT include those who have chosen this means, I mean, it’s a free world isn’t it ? A failure to identify the target and using a scatter-gun approach,is isolating deaf from each other, all because one preferred a mode the other doesn’t support. You have the right to choose your method and I’d back you up on that right. The problem isn’t so much oralism itself, but that AG Bell was pretty dismissive of ASL in that first letter of theirs, plus their actions have been dismissive. I feel there is no place for hate on either side, and yes I’d rather we all united. I believe in giving kids all the communication opportunities, including ASL and English, and let the kids make their own choices when they grow up. Definitely you should not be targeted for your own choice. I am pleased with J. Parrish Lewis’ s article. We need to seek fair solutions and equal opportunities with love.Thought I would give you my views of the two disputing groups. I learned gestures (home signs) and remember I cried a lot. My first language was ASL when I enrolled a deaf school at 6 years old. I am little old now in comparison with deaf people in 1980’s or 1990. I was very concerned about more deaf scjhools being closed and more deaf children going to mainstreamed schools. There were more new hearing devices very attractive. Cochlear implants became very popular. My older sister was hard of hearing and wore hearing aids. She went to a public school and deaf school both. She could talk well, yet she never felt comfortable around the hearing people. She worried about how to pronounce words right, not like when she worried about how to sign. She loved deaf communities. ASL is a blessing for children who are stressed out from perfection. I cherish my old memories. I would love to see more deaf schools, more deaf communities, and deaf-related events here. If we do not act they could be nonexistant anytime soon. Thank you for sharing your story! I’d love to see unity happen, and I think both sides need to be receptive to that, regardless of the past. This is not an either/or issue, as hearing, or the absence of, is multi-faceted, and personally I see a mixed bag of tools to be the best option for anyone with hearing issues, no matter if they were acquired before or after birth. There are different approaches, methods, and trains of thought about what it is the right way to go on this subject, and no one way is the right way. I’ve had a hearing loss since childhood (diagnosed in the 1960s) and I pretty much had to figure it out by myself, as I didn’t have anyone to advocate for me, so I’m hardwired to be a lipreader for lack of knowing there were other choices. I went about living my life and figuring it out, but I was pretty much isolated. Once the Internet became popular, well into my adulthood, I began my education… one aspect of that was becoming aware of the division between the different groups with hearing issues. Frankly, I preferred being in the dark on that front. That said, I find it hard to digest how any group wanting the world to recognize and accommodate them fails to do so for others. Whichever group is trying to forward their “better way”, shouldn’t they at very least recognize that as a group we have more power when the focus draws attention to what unites us? If inclusion is what you want, shouldn’t inclusion be what you offer? Shame on those that perpetrate this division, no matter which side they’re on. Thank you for sharing, Michele. I agree that we’ve got to be accessible and inclusive in both communities. Happy to say that my agency does honor requests for captioning!